My daugher has a little storybook called, My Mother Gave Me the Moon. It is a book of soft-edge, muted pastel illustrations of a beautiful mother and a very sweet little girl. Each page chronicles their journey together with the mother leading her daughter softly by the hand, and showing her the world. The weather in these pages is mild and welcoming, even in winter. The mother casts a soft glows one each page, as a kind of mother Theresa, who has so unselfishly dedicated her heart and soul to showing her child the wonder of this world, and the child receives her, in wide-eyed rapture, so receptive and joyfully prancing about her new world in awe. Reading this book is uncomfortable because, despite all my desires and wishes to the contrary, I haven't experienced motherhood in this gentle or dreamy way. The years of being a mother have often felt like more of a tugging and pulling from one moment to the next, in hopes of finding the right set of variables to arrive to some ambiguous place. And truly, the only place I have arrived, is to an age where I now see my children's inevitable flight from my nest within less than a decade. I remember fantasizing of little girl babies with blond hair and blue eyes (two of which I later would have) filling my doll cradles, and basked in the soft dreams I had for us--everything I would make right in our world when it was my turn to mother. Nobody prepared me for such an acute inability to reconcile the romantic picture I held in my head, that was very largely idealized and reinforced by the culture of my upbringing, with an often harsh and jagged reality of chasing after some elusive idea of perfection dangled right before me FOR YEARS AND MORE YEARS! And it is I who will readily admit that I have given my children less of a soft place to land, and more declarations of war and subsequent commands from my post, and often I feel like I am fighting a war that I just don't believe in, and really never have--and yet am too afraid to just let go, and to cuddle them softly (which now they'd barely let me if I tried) with laughter and true presence and wonder, playing hookie from a world that can fuel its own self-importance, thank you very much. And yet, that is the tremendous paradox, that by adhering to the rules, I am trying to save them from being eaten up by the world, and yet I feel like I am the looming monster. Who has time for the moon when you are pointing out all the pitfalls. Yet, if there is one thing I have learned is this: that following the rules does not protect you from life, but mostly squashes you and keeps you small and largely lacking in adventure. When my girls were little, I hoped I would get it together before they were old enough to remember my 'sins'. That time has long come and gone. They will remember me with harsh edges, shadows and storms. There will be good memories too. But if I have learned another thing, it is that we have selective memories, and often remember pain. So, I have to accept how imperfectly and really just sometimes mean and childish I have been in pursuit of control and the need for order, a climate which children just so readily resist and flail about in. And when I speak of this to friends, they often tell me, 'You are a good mother. They are lucky to have you. You are teaching them to be strong, to get things done, to be their best selves and overcome their vices.' Well, they might not think that if they saw me at my worst, however, this isn't about releasing me from my sins. I've long begun to stop berating myself for my brazen and untameable humanness, for my flaws, for my inability to just grin and bear it. I can see experience for what it is. But the reason I write this today, is that it was time to face the discomfort of this book that sits in my house, instead of letting it passively chastise me from my daughter's bookshelf. So, I let myself just feel it and face the raw of it, without looking away or distracting myself. And what I find is that I just want to allow myself to mourn with my daughter, that fact that those beautiful pictures haven't been a reality. I want to allow us to be so incredibly heart-broken that those sweet pictures don't fill both of our hearts with soft glowing warmth, and instead that we do in fact live with wounds that we aren't quite sure will ever heal, and we just hope that we haven't done too much damage doing our true best, which might fall a little too short, at what often feels like a very ironic human experiment.How difficult it can be with the ones you most love. 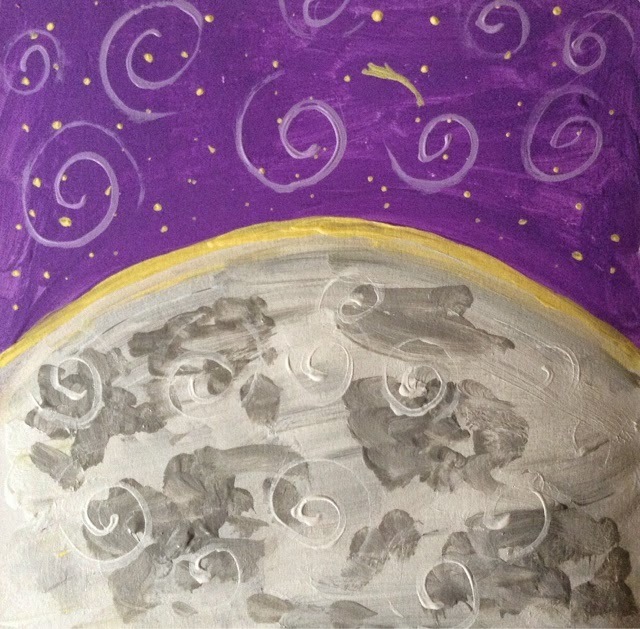 I decided to paint a moon for my daughter, pictured above. It is the only moon I can give my daughter really. We can touch it in our hands and caress the paint strokes that will dry to reveal a purple horizon over the moon, and a sky full of stars, and swirls of the universe, which feel like little hugs to me. And all I can do is just feel the past that lives in my heart, and a future that is unknown, but feels open and endlessly unpredictable and uncontrollable, and feel the constant of the moon and stars above us. Maybe it is time to fully embrace myself as nothing more than a Life form on this planet, as arrogant as we are as humans, to think we can clean up every mess visible and invisible, and take my rightful place as a mini universe within a greater one. Maybe it is time to see myself as part of Nature, not as a force to conquer, but to experience; full of mysterious forces and capable of unfathomable destruction as well as creation. Maybe it is time for me to stop trying to tame the forces within anyone. Maybe it is time to admit how deep my fear of being alive and mortal has been, and that I've been running like hell in the opposite direction my entire life, using my suffocating nurturing and controlling to deflect how truly afraid I am to fall. Maybe it is time for me to come clean. So, my daughter I may not give you the moon, but I give you my broken heart, that I promise, started out with the most beautiful intentions to give you everything, to nurture your love of life, of others, of learning and growing, and mostly of seeing and honoring your very own miracle self, and your unique soul landscape. Yet, all I can do is tell you that the storms within me were more ravaging than I could have imagined, and that I am well aware that there have been casualties by me. And although I will never know where the path seemed to fork, and I took a different road, I know that I no longer seek a perfect, fuzzy picture of you and me. I am just here beside you, and in the calm I will look at you, and see the miracle of you, and in the storm, I might become thunder. But know that I also receive and accept the storms of you, and it is unconditional. And perhaps it's okay. Perhaps it was never meant to be any other way. Update: it is ironic that in writing this post I have felt greatly inspired to pick up my daughter's book, look at each page with her, and to trek out to show her the wonder of the world. Who would have ever imagined that the book that plagued me so, would become a guidebook to wonder incognito. And this is why WE MUST MAKE ART! Right away I knew it was the moon with its ghostly shadows, and luminous shawl, set in amethyst and kissed by the swirling universe. Brooke, I love this painting. It is the most perfect moon painting in existence. We must make Art! When I read this post I had so many emotions--the imperfections, always falling short of the romantic stories, cutting off the feet of my motherhood, because no matter how much closer the moon was to the earth than the sun, I never seemed able to reach it. Because I hadn’t fully embraced myself, accepting who I was, as I was, I felt as out of step with life as a left-footed buffalo in a ballet class. This awkwardness carried over to my parenting, where I constantly compared myself to the brilliance of the other moon-glowing mothers, and paled in comparison. But here’s the thing that I didn’t realize at the time: because I didn’t love and accept myself or my life, and I viewed my kids as extensions of myself rather than seeing them as separate autonomous beings, I carried my flawed view of myself over to them and treated them as if they were flawed. Oh, it was subtle, hardly noticeable, but it was there, and although I could feel the sadness of it, I couldn’t pin point what the problem was. All those romantic cultural notions about motherhood and moon beams that were fed to me as a child, along with my own complicated childhood, led me despise much of my life and overlook the stunning beauty of my moon, and my kid’s moon. I missed most of the beautiful uniqueness of them because I was so busy measuring everything against some phantom status quo. Trying to fit in and be something that I wasn’t. And now I’m 58, and my kids have flown, with good enough wings, towards the majestic moon, to discover the absolute brilliance of themselves and the universe, and perhaps blame me for my blindness. All I can say is that I’m sorry, or maybe I’m not. Not really. If I had known better I would have done better (Thanks Maya), but I didn’t, so I couldn’t. But even that is beautiful. Even that, when held up to the moonlight, has a bit of a glow to it all of its own, and I can finally appreciate that. I can appreciate this ever-messy life, and the, oh so fearful, me. I can love it all. Brooke, your writings are such a rich field. I love going there with you and discovering the gold. I'm so excited that you trekked on through to the other side. I intend to find that little book and see for myself.